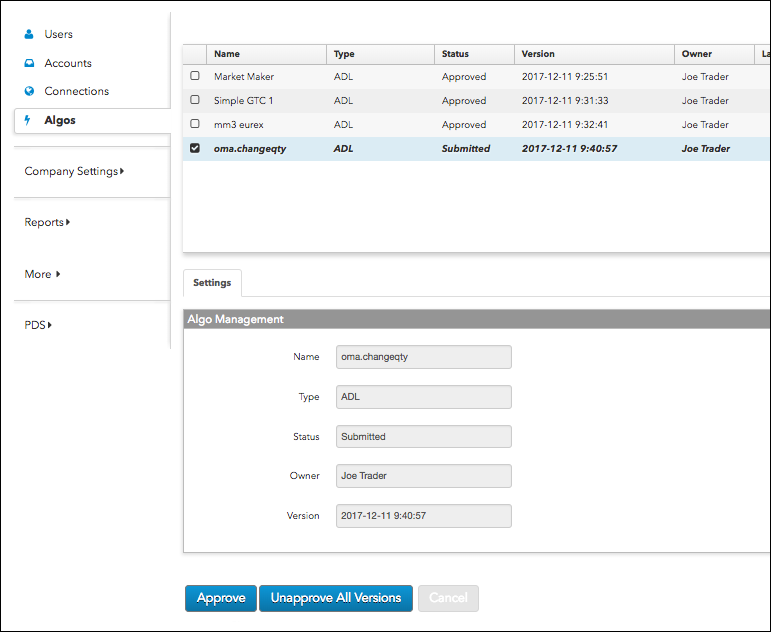 The Setup application provides company administrators with the ability to manage which users can deploy and run their own algos. Requires Permissions to Run Own Algos and Algo Approver settings on the User | Settings tab. Approval options on the Algos tab in the left navigation panel. ADL Algo Approval Required setting on the Accounts | Users and Users | Accounts tabs. To provide algo management for users, there are two checkboxes in the Algo Permissions section under Users | Settings. Note: The Requires Permissions to Run Own Algos setting appears only for the Live environment, which lets users run and test any of their algos in the Simulation and Delayed Prices environments without needing approval. The Requires Permissions to Run Own Algos checkbox controls whether users can deploy algos without requiring approval. By default, all existing users have this option unchecked, while new users have this checkbox checked. When checked, the user cannot run an algo that is unapproved, and must submit algos for approval via the Deploy option in ADL. When unchecked, users can run algos using accounts with algo order permissions enabled without needing approval. Note: The Requires Permissions to Run Own Algos setting is not shown in the Live and Delayed Prices environments. The Algo Approver checkbox allows users to view names of all algos that have been submitted for approval and mark each algo as "approved" or "unapproved" as needed. By default, users with Setup administrator permissions have this option checked, but algo approver permissions can be set for other users in your company, as well. The ADL Algo Approval Required setting determines whether the user can submit ADL algo orders on the account without approval. When this option is unchecked, the selected user does not require approval for algos on the selected account. To support optional algo permissioning, the Algos tab in the left navigation panel provides you the ability to approve ADL algos for users in your company. Each algo submitted for approval includes the algo name, type, status, owner, and version; as well as the option to "Approve" or "Unapprove all versions" the algo. If the Requires Permissions to Run Own Algos setting is checked for a user, then their algos will have to be approved in the Algos tab before they can be run. Only algos that users submit for approval will appear in this section, and can only be approved by users with the Algo Approver setting enabled. If algo approval is required when a user attempts to deploy an algo in ADL, a pop-up window appears and allows the user to submit the algo for approval to their company and/or broker(s). Once submitted, the algo appears in Setup for approval, and the algo approver can approve it. Approved algos appear in the user's ADL dashboard in the Trade application and can be launched in the market. To export a list of approved algos in the Algos tab data grid, click Grid Options in the upper right corner of the grid and select Export Grid.